In that increasingly boring quest for precursors to hypertextuality, many have described Camillo's Theatre of Memory as a kind of proto-WWW, where knowledge is readily accessible at any moment, neatly indexed and stored away. In one of the more eloquent essays to tap into this metaphor, Leah Marcus describes the computer as, like the Memory Theatre, yet another "device for artificial memory, a small box that we conceptualize as an office or a highway, or as a whole world, with files, folders, and web sites instead of rooms or drawers, from which items to be remembered can be readily retrieved by the user" (from "The Silence of the Archive and the Noise of Cyberspace," in The Renaissance Computer). And of course, both cyberspace and classical ars memorandi rely on metaphors of space and architecture -- of connections between different rooms, portals, "sites," each imbued with significance through images of the monstrous and the disgusting, or marked with deeply personal memories. information. Of course, Camillo could have built a flat wall -- in fact, at the risk of belaboring this point, it seems all of the most obvious information storage systems are flat, rectangular surfaces that stack information vertically along horizontal lines, including libraries, walls of shelving, and even books themselves. So why a round theatre? There's something going on with roundness in the sixteenth and seventeenth centuries -- particularly roundness as a means of storing and organizing information, text. 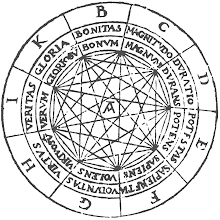 By Camillo's time, Ramon Lull's circles (or Lullian circles) had been popular little instruments for a few centuries, both directly and indirectly influencing a whole host of faddish volvelle-toting volumes: astrological and astronomical charts, moving paper planets, calendars and time-keepers. 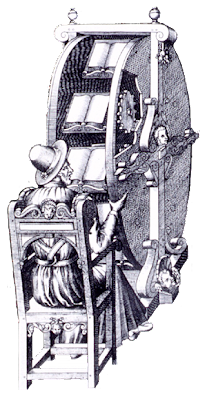 Agostino Ramelli invented his bookwheel in 1588, a ferris-wheel-like means of reading multiple volumes at one time, and just a few decades later poets such as G. P. Harsdörffer and Juan Caramuel y Lobkowitz used wheels to mechanically generate and permute lines of poetry. Although a history of early modern roundness has yet to be written, the circle (or wheel or volvelle) sure seems to crop up a lot, especially in projects that like to flirt with infinity. It seems to me that Camillo's Theatre of Memory exists in this culture of roundness, where information -- relentlessly linear written text -- pursues the neverending loop of spirals and permutation, of circles and cycles. Just before Galileo looked heavenward to observe a heliocentric universe full of rotating bodies, Camillo imagined his little rows of drawers spiraling upward, a galaxy of knowledge with man at the center. It's time to think outside the rectangle and beyond the linear to discover knowledge in the round. "Frances Yates & the Hermetic Tradition" by Marjorie G. Jones, the first biography of Frances Yates (1899-1981), has been been published by Ibis Press. Could you list the source of your image for Camillo's theatre? Thanks!